West Grove Borough applied for and was awarded grant money to improve their commercial district. 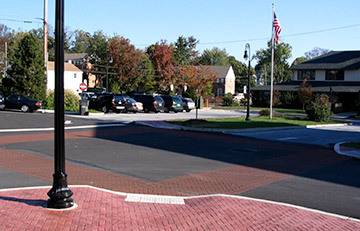 As the Borough’s Engineer, Hanover Engineering assisted the Borough with the design, bidding and construction of their “streetscape” project, which included infrastructure improvements, as well as design and development of an attractive town center area. Infrastructure improvements consisted of approximately 3,500 linear feet (LF) of new water mains, reconnection of over 60 water service connections, two replacement and two new fire hydrants, as well as the upgrading or replacement of approximately 1,800 LF of storm sewer piping and inlets. Handicap accessibility was improved within the project area through the installation of new Americans with Disabilities Act (ADA) compliant curb ramps. Additionally, several roadways in the project area were reconstructed and sidewalks were restored and/or upgraded along Rosehill Avenue and Edgehill Avenue. The Borough’s town center area was aesthetically improved with the installation of stamped concrete sidewalks, decorative lighting, and new street trees. Overhead utilities were relocated through rear alleyways. Contract management services and site observation. In addition, numerous utility easement and property line issues were identified and resolved by the design team during the course of the project.